Elegant room scene showing the warmth and texture of real wood. With the growing trend of using wood furniture in interior design over disposable big box store furniture. Thus, decreasing waste and promoting sustainability and environmental responsibility. This style is typically built in small custom furniture studios rather than large factories. It is also built using solid natural wood rather than man-made materials such as plywood, particle board. Yes, the man-made material can produce a nice and cheap product but sadly they will not stand the test of time. Thus, they are none repairable and sadly are discarded and end up in an already clogged landfill. This cycle is never-ending. Although furniture built from real solid wood has shown that it can stand the test of time. It is more often than not repairable or finds new life in repurposed furniture. Wood is probably the most natural material out there and can be used in every part of your home. Whether in the bedroom, living room to the kitchen and bathroom wood will bring warmth and balance to your home’s decor. Know, let’s explore how to incorporate wood furniture and natural wood décor into your interior design. Here are a couple of ideas that might help you. One of the easiest ways to add wood furniture is in the bedroom. The perfect natural wood bed will help in creating a calm and inviting bedroom, thus promoting a restful night’s sleep. 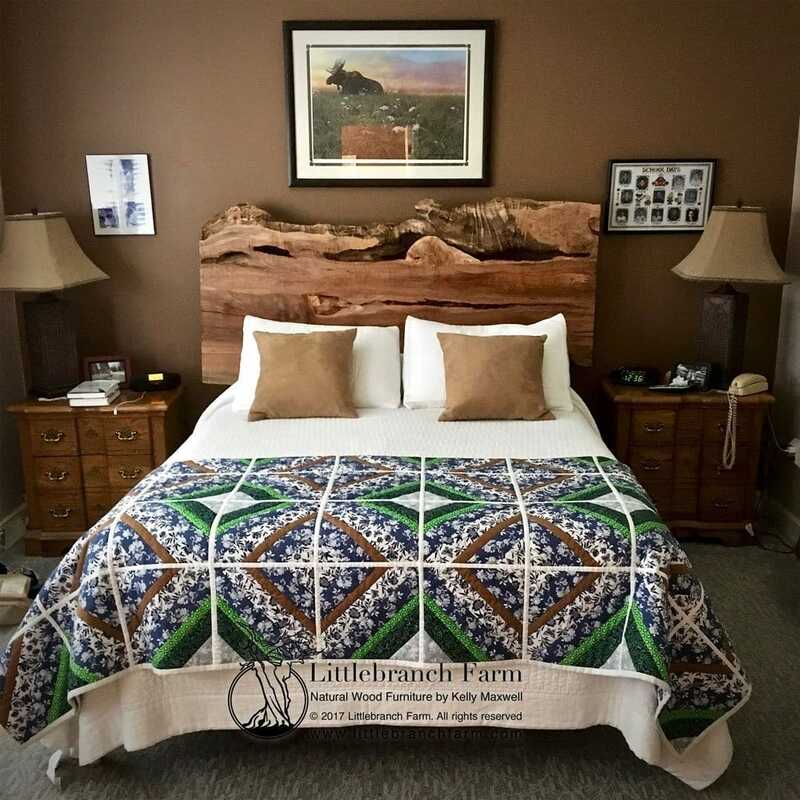 Whether you purchase a custom built natural wood bed, or a stock bed built by a custom furniture design studio, choose the style bed frame you like. In the interior design process, the furniture should be at the top of the list. This will allow for the beauty of the wood to shine through. Whether the homes décor is rustic, contemporary, or modern a handcrafted wood bed will complement the décor. A log bed is not only eco-friendly but is also easy to build and cheap to build for a DIY project. With Youtube and other video options, you can learn how to build a log bed and other types of log furniture. These projects will take simple tools and some good old hard work, but the end result is gratifying. Reclaimed wood furniture isn’t everyone’s cup of tea but it’s literally the best idea in the world to use reclaimed wood when it comes to furnishing your home. This style incorporates materials such as barn wood, pallet wood, and salvaged old wood furniture. Thus, giving old furniture and reclaimed and salvaged wood a new chance to shine. Repurposing old barn wood and turning them into a dining table or even a salvaged burl wood slab that finds new life as an office desk. Another option is taking antique furniture that needs a little TLC and refinish it giving new life. Sadly, some furniture is built using veneered wood and not real solid lumber and can be difficult to repair or even repurpose. Giving old buildings and spaces a new purpose and turning them into family homes is another way to use all the resources we have and salvage as much as possible. That’s why lots of homes are featuring old wooden beams, but instead of letting them rot and look ugly. The owners fixed them and gave them the love they deserve. Repainting your old ceiling beams is so easy that you can do it year after year. Constantly changing the look of your interior and always keeping it fresh. You can also connect these beams with the exterior of your home and create a unique flow between your living room and patio. Of course, you’re going to need a way to get in and out too, so pick some practical timber sliding doors that are visually attractive and rather elegant. Nothing warms a room more than natural wood. Thus well-planned fireplace mantel or wood beam will give a lot of wow for your buck. Whether it is a hand-hewn reclaimed wood beam salvaged from an old barn. A live edge wood beam cut from a log salvaged from the forest floor. They will both surely warm your homes décor. 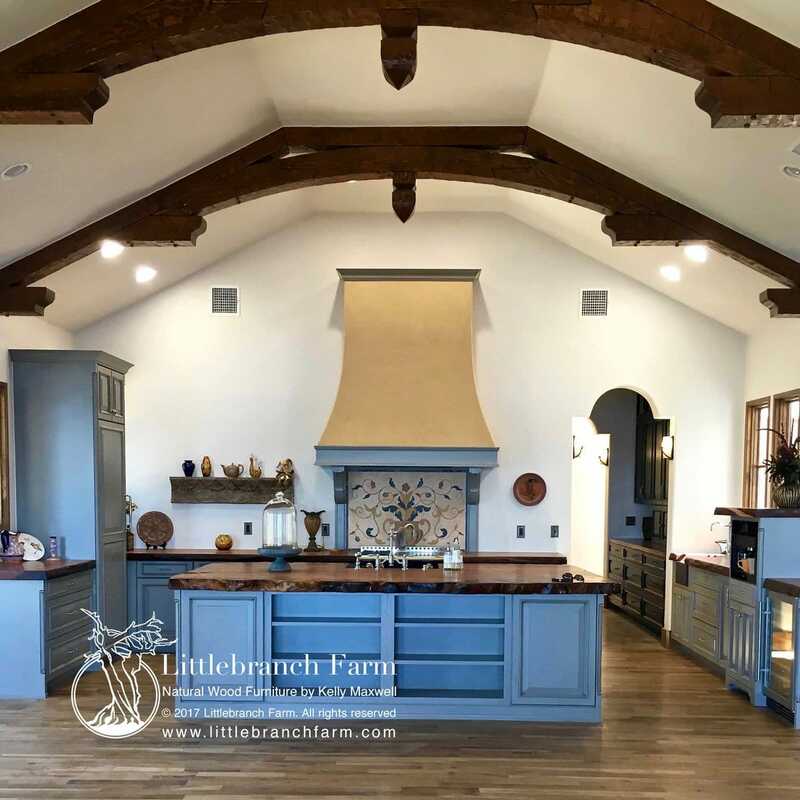 It makes perfect sense as many of today’s interior designs incorporate natural wood beams, fireplace mantels, and main wood furniture pieces as the foundation. 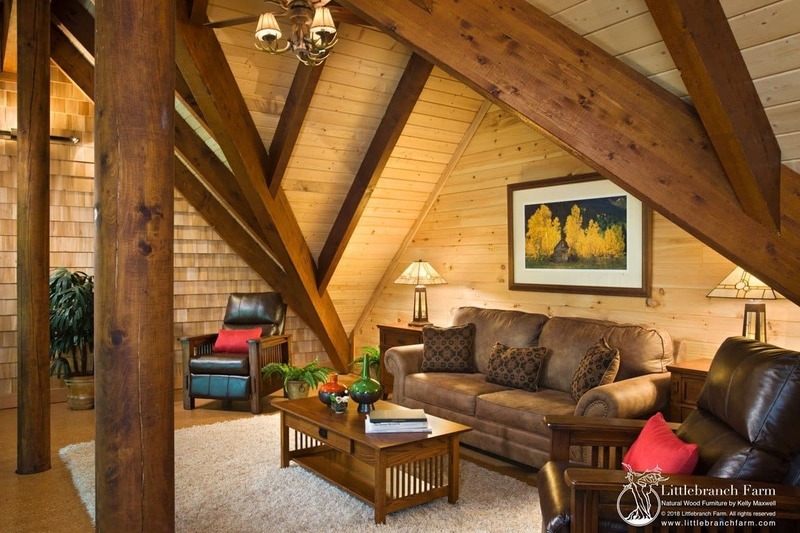 By using paint or wallpaper to accent the natural beauty of the wood beams you bring the color needed in your decor. An interesting fact is the fireplace is one of the main focal points in a home. Usually found in the gathering room and either accents or is the statement. A wood fireplace mantel milled from a salvaged old growth redwood that features a gnarly live edge is always a show stopper. Mounting a fireplace mantel has evolved from using corbels to mounting as if it is floating. 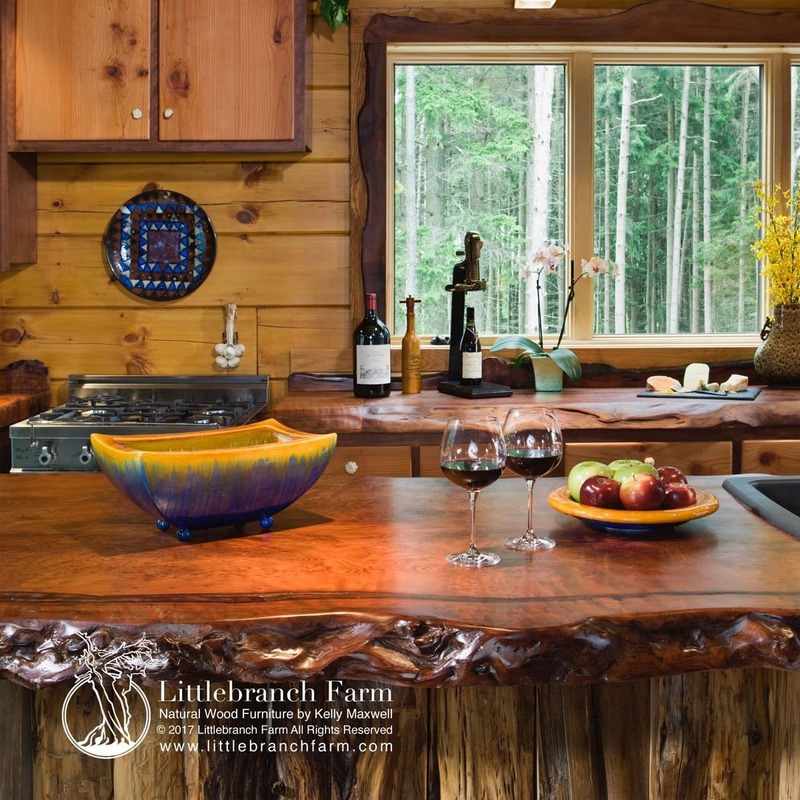 Lots of people love using natural wood in their kitchens. Many are opting to paint their wood cabinets. However, if you really want to take things to a new level, you should think about incorporating a wood countertop into your kitchen. Instead of using marble, quartz or granite, go with wood and you’ll feel like a real chef in a matter of seconds! 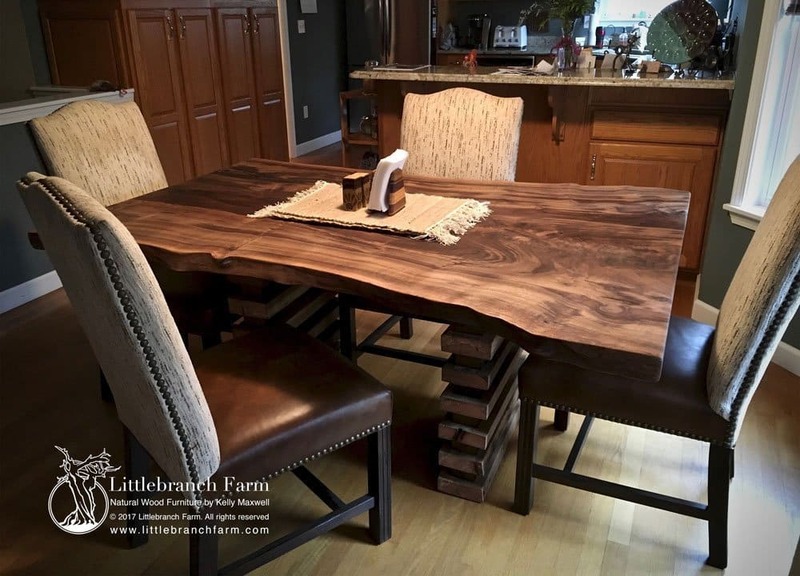 Whether your preference butcher block countertop or an organic live edge wood countertop your kitchen will be the envy of friends and family alike. Like wood furniture it is good to ask questions and choose a woodworker with experience. A few good questions are? What kind of finish is used and is it non-toxic and VOC free? How durable and is it waterproof? How to care for the finished product? Real wood countertops even just a wood island top or bar top will complement your kitchen décor. A space that is commonly neglected is the bathroom. 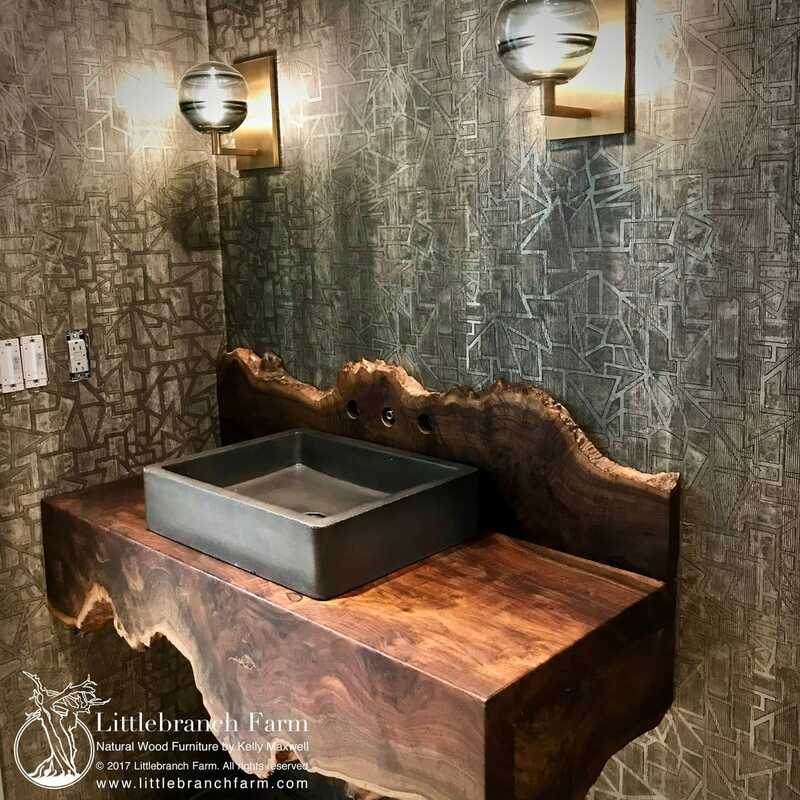 Whether it is a half bath or master spa retreat a custom wood vanity will set your space apart. Wood is the best way to elevate the aesthetic appeal of any space, and since the bathroom is our personal sanctuary and private oasis, wood can help us find inner peace and calm. The use of natural stone balanced with the warmth and stability of natural wood will create a zin or spa bathroom. 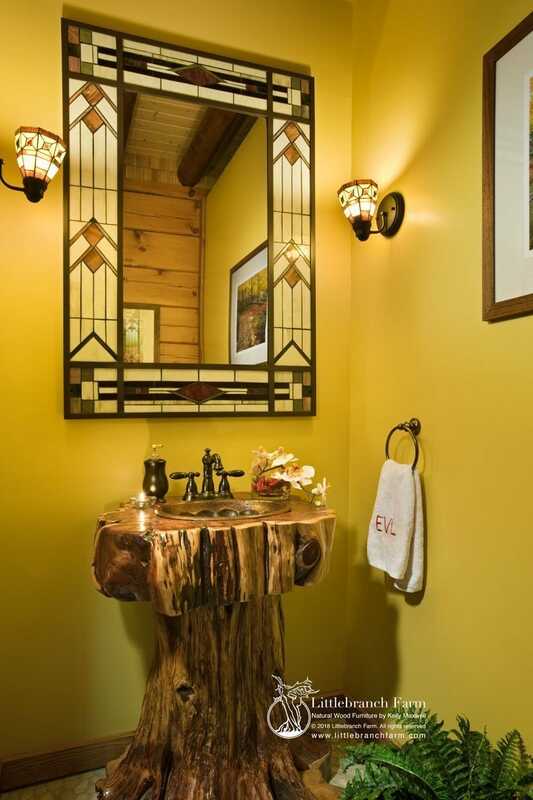 By incorporating a log style rustic vanity bring the calming effect of nature. 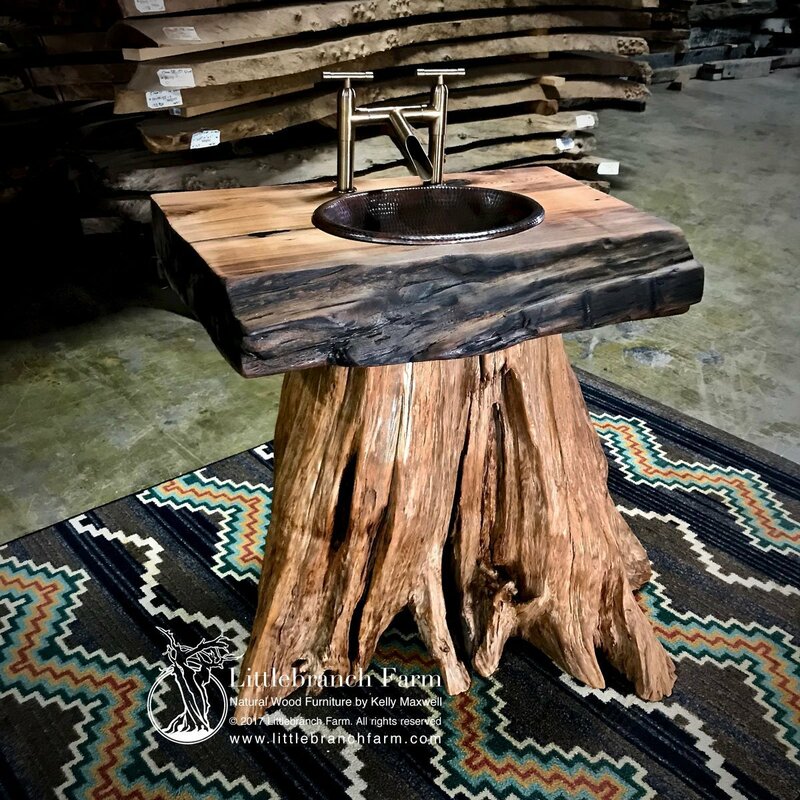 There are lots of different types of bathroom vanities that can fit into any space, so you can go as rustic or modern as you like. Keep in mind that this little feature is going to bring in a new dose of elegance into your bathroom and make it more appealing than ever – maybe even turn it into the focal point of your entire home! Remember it is always easy to change colors through accent pillows, paint, lighting, and other décor accent pieces. By buying quality wood furniture crafted from ethically sourced wood makes sense. Both in an economic and eco-friendly impact.